When you’re ready for feedback, submit a pull request. 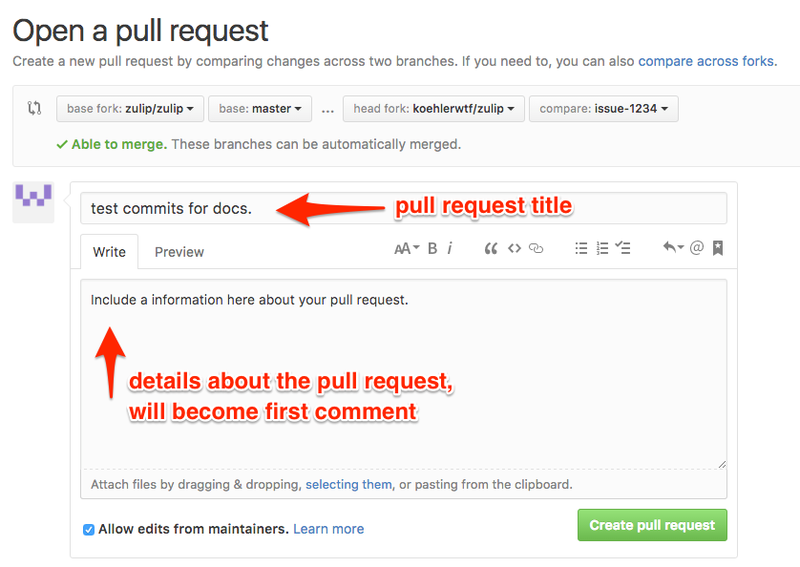 Pull requests are a feature specific to GitHub. They provide a simple, web-based way to submit your work (often called “patches”) to a project. It’s called a pull request because you’re asking the project to pull changes from your fork. If you’re unfamiliar with how to create a pull request, you can check out GitHub’s documentation on creating a pull request from a fork. You might also find GitHub’s article about pull requests helpful. That all said, the tutorial below will walk you through the process. In the Zulip project, we encourage submitting work-in-progress pull requests early and often. This allows you to share your code to make it easier to get feedback and help with your changes. Prefix the titles of work-in-progress pull requests with [WIP], which in our project means that you don’t think your pull request is ready to be merged (e.g. it might not work or pass tests). This sets expectations correctly for any feedback from other developers, and prevents your work from being merged before you’re confident in it. The best way to update your branch is with git fetch and git rebase. Do not use git pull or git merge as this will create merge commits. See keep your fork up to date for details. If you’ve never created a pull request or need a refresher, take a look at GitHub’s article creating a pull request from a fork. We’ll briefly review the process here. The first step in creating a pull request is to use your web browser to navigate to your fork of Zulip. Sign in to GitHub if you haven’t already. Next, navigate to the branch you’ve been working on. Do this by clicking on the Branch button and selecting the relevant branch. Finally, click the New pull request button. Alternatively, if you’ve recently pushed to your fork, you will see a green Compare & pull request button. Provide a title and first comment for your pull request. Remember to prefix your pull request title with [WIP] if it is a work-in-progress. If your pull request has an effect on the visuals of a component, you might want to include a screenshot of this change or a GIF of the interaction in your first comment. This will allow reviewers to comment on your changes without having to checkout your branch; you can find a list of tools you can use for this over here. When ready, click the green Create pull request to submit the pull request. Note: Pull request titles are different from commit messages. Commit messages can be edited with git commit --amend, git rebase -i, etc., while the title of a pull request can only be edited via GitHub. As you get make progress on your feature or bugfix, your pull request, once submitted, will be updated each time you [push commits][self-push-commits] to your remote branch. This means you can keep your pull request open as long as you need, rather than closing and opening new ones for the same feature or bugfix. It’s a good idea to keep your pull request mergeable with Zulip upstream by frequently fetching, rebasing, and pushing changes. See keep your fork up to date for details. You might also find this excellent article How to Rebase a Pull Request helpful. And, as you address review comments others have made, we recommend posting a follow-up comment in which you: a) ask for any clarifications you need, b) explain to the reviewer how you solved any problems they mentioned, and c) ask for another review.